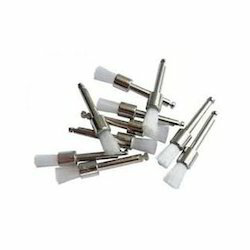 We are recognized as the foremost manufacturer and supplier of highly trendy Nylon End Brush. The offered product is manufactured by our highly skilled professionals using premium quality raw material and sophisticated techniques. Our product is known for its features like durability, compact design and unmatched quality. We also provide this product in several designs, sizes and finishes that perfectly suits clients’ exact requirements. Client can avail this product from us at market leading price. We are engaged in offering a vast array of Nylon Brush to our client at market leading price. These nylon brushes are fabricated by using quality raw material and known for their high performance & productivity in market. Our products are as per industry standards and norms to fulfil the market requirements. Nylon End Brush especially suited for use on portable air and electric tools CNG and robotic equipment the end brush is designed for work where space limitationsare a factor in most application , higher speed up to 10000 RPM are required for effective brushing action. Nylon End Brush fill materials High carbon wire, steel wire, brass coated, brass nylon, stainless steel wire, abrasive nylon. Application rubber and plastic mold cleaning, cleaning pipe id removing rust weld scale and spatter cleaning castings burr removal rubber flash removal carbon removal spot facing cleaning and finishing recessed areas.